One of the greatest challenges for professionals today is combining resolution of technical issues while maintaining excellent customer service skills. Customer satisfaction comes from effective communication just as much as from obtaining a technical solution. This Support Professional course from Service Strategies addresses this challenge. During this 2-day course support professionals are trained in the customer skills necessary to deliver quality services in the current complex support environment. This support training program be the force that sets individuals and companies apart as the best in the technology support industry. The Course will teach practical skills in effective communication, telephone and online professionalism, questioning techniques, and teamwork, among others. At the end of the course, students are prepared to take the in-class written exam to become a Certified Support Professional. Cost of the exam has been included in the course registration fee. Service Strategies offers private classes at your site for up to 15 students per class. These classes are led by certified instructors with extensive, professional industry experience. The course includes team exercises and covers concepts that are directly relevant to support professionals and the real world situations they face every day. Service Strategies offers public classes in various cities throughout the year. These classes are led by certified instructors with extensive, professional industry experience. If your company has more than six candidates for the course, you are eligible to host it on your premises. Contact Service Strategies for more information about this opportunity. The Support Professional online training course from Service Strategies combinations teaching and interactivity in a way that enables students to learn , and to apply that knowledge to real world situations. Students are allowed access for 60 consecutive days to complete the course once they have registered. 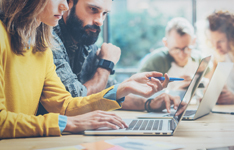 The blended learning option is an instructional model that combines the self-paced online training with tailored onsite or remote reinforcement. Blended learning will reinforce course objectives in a group setting using exercises and examples tailored to your unique environment. This is great option that allows the students to learn online on their own time, but then will reinforce all of their new knowledge with in person learning. Fill out your details to find out more about Support Professional. Even experienced people can benefit from this class! Great Support Professional class! Even experienced people can benefit from this! Thanks! The hands-on practices are excellent for reinforcing learning objectives and helped keep me engaged. The Support Professional class was very interactive and a great way to get these skills across.